The HLAA book club met at the Sanderson Center last Saturday to discuss Wild: From Lost to Found on the Pacific Coast Trail by Cheryl Strayed. We were all awed by her journey, Monster (her backpack) and we still wonder how she accomplished it with all the problems with her feet. We talked about the little black frogs, the bow hunters, the tragedy with her mothers horse, and more. We came up with some great insights too such as perhaps Monster represented the emotional weight she carried since her mother’s death. The condition of her feet may represent how much her heart as well. 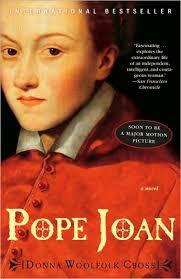 Our next book, chosen by Kathy is Pope Joan by Donna Woolfolk Cross. We will discuss this book Saturday April 18th at the Sanderson Center in classroom B/C with the hearing loop and CART. Anyone can join us. Here’s a short review from Amazon: For a thousand years men have denied her existence–Pope Joan, the woman who disguised herself as a man and rose to rule Christianity for two years. Now this compelling novel animates the legend with a portrait of an unforgettable woman who struggles against restrictions her soul cannot accept. When her older brother dies in a Viking attack, the brilliant young Joan assumes his identity and enters a Benedictine monastery where, as Brother John Anglicus, she distinguishes herself as a scholar and healer. Eventually drawn to Rome, she soon becomes enmeshed in a dangerous mix of powerful passion and explosive politics that threatens her life even as it elevates her to the highest throne in the Western world. This book is based on a legend, learn more at wikipedia.